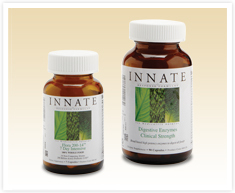 The mission of Innate Response Formulas is to develop and produce products to support the body’s innate healing response. They focus exclusively on providing the finest high quality, whole food supplements available to health practitioners today. Innate Response Formulas is committed to providing clinically effective whole food supplements, respecting the phytonutrient synergy of the compounds that can only be provided by whole food. And, they look first to source certified organic and non-GMO ingredients.